In 2018, we're reviving a popular past feature on the blog: the Magpie of the Month, where we explore the jewelry box of one royal lady each week for an entire month! 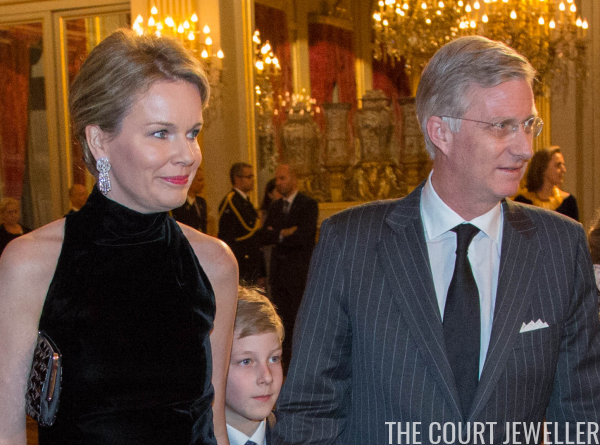 This January, our Magpie is Queen Mathilde of the Belgians, and we're starting with something very sparkly: one of her beautiful pairs of diamond fringe earrings. These diamond earrings, which feature a five-stranded fringed tassel dangling from a nautilus-style stud, have been staples in Mathilde's jewelry wardrobe for around five years. The sparkle of the pair makes them a perfect choice for gala functions. Above, she wears them in April 2013 at the pre-inauguration dinner in the Netherlands, pairing them with her laurel wreath tiara and the diamond fringe brooch that belonged to Queen Fabiola. 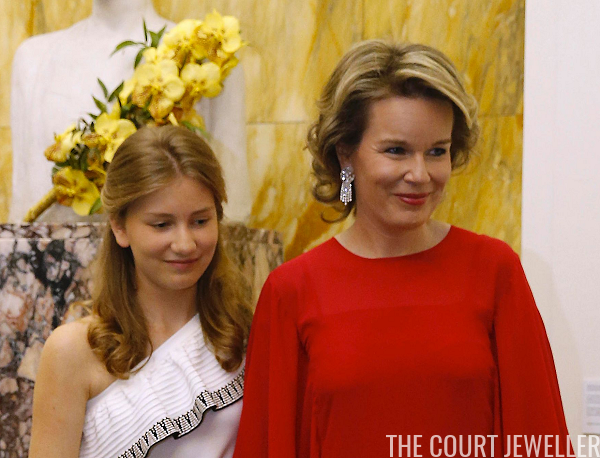 Although the earrings pair nicely with tiaras and other gala jewels, Mathilde also sometimes wears them for important daytime events. Here, they pulled double duty during the Dutch inauguration, making a second appearance at the inauguration itself. ...and at a state banquet for the President and First Lady of China at Laeken in March of the same year. 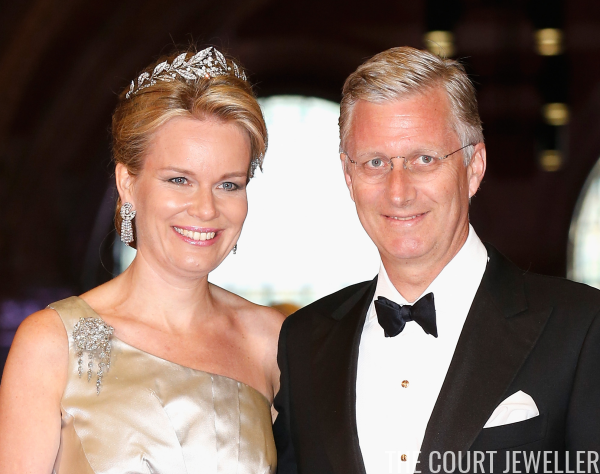 On this occasion, she also wore the bandeau base of the Nine Provinces Tiara, a sparkler only worn by Belgian queens. In 2016, she wore them for the annual concert held as part of the country's National Day festivities in July. And last year, she wore them to attend the Queen Elisabeth Cello Competition with her eldest child, Princess Elisabeth, Duchess of Brabant. But Mathilde's jewelry collection just keeps growing, and this pair isn't the only pair of diamond fringe earrings in her jewelry box. 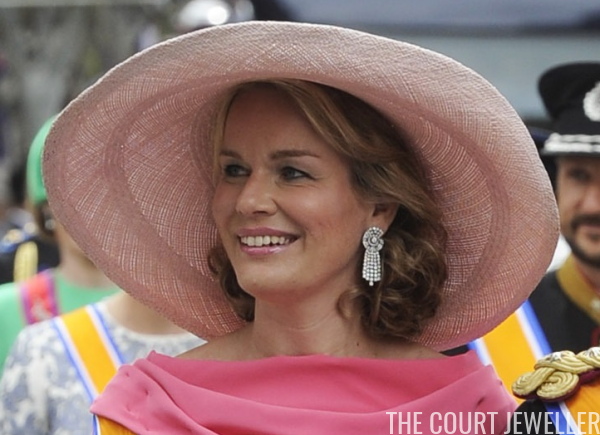 At the Norwegian birthday celebrations in May, she wore a different pair of diamond fringe earrings. You'll note that the stud of this pair of earrings includes ribbon-like designs, and the three fringes appear to be longer and feature different cuts of diamonds.